The Samsung Galaxy J3 Achieve is a device with a 5-inch HD TFT display. The phone is powered by a 1.3GHz Octa-Core processor with 2GB of RAM and 16GB internal storage. There is a microSD card slot for up to 400GB memory expansion. The device has an 8-megapixel sensor and video recorder. In front, there is a 5-megapixel camera for selfies and video calls. It includes a 2600mAh removable battery that can last up to 29 hours of talk time. The phone runs on Android 8 Oreo upon release. 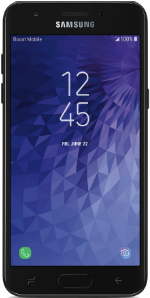 Samsung J3 Orbit Was: $99.99 Now: $59.99.